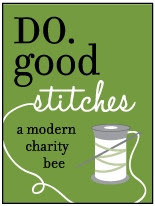 Today was a day for some fun sewing projects. 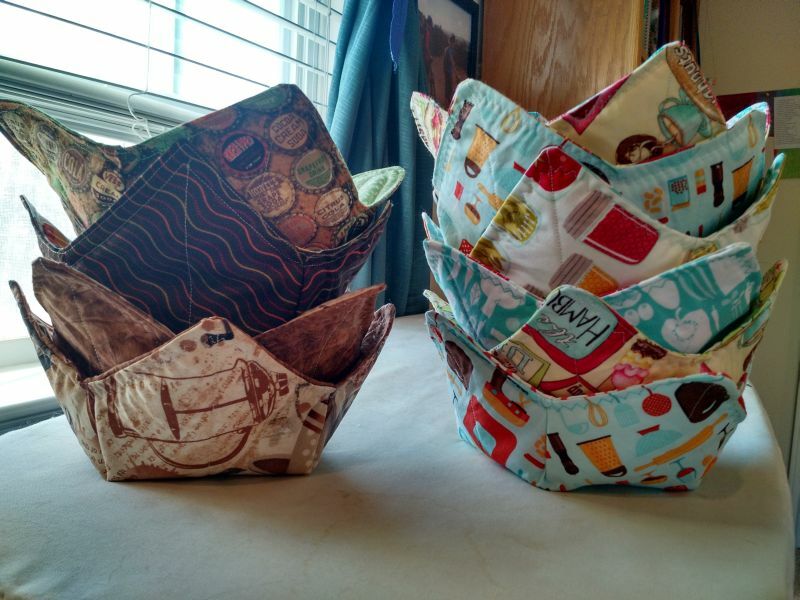 First up I made a batch of fabric bowl-cozies. Have you seen these? It's to keep your hot bowl from burning your hands if you microwave soup or something. I used this tutorial. Several of my friends and family have expressed an interest in these so I figured I better get busy :) A good excuse to use some stash and some leftover batting scraps. I didn't really count as I was cutting fabrics and batting, just used up what I had. I ended up making 10 bowl-cozies. I found some really fun kitchen-themed fabrics in my stash. These are reversible and washable and make a great quick gift. I would definitely recommend it if you haven't ever tried to make them before! Next up I cut into my green scraps for this month's Rainbow Scrap Challenge. I'm almost done with my purples and blues from earlier in the year. 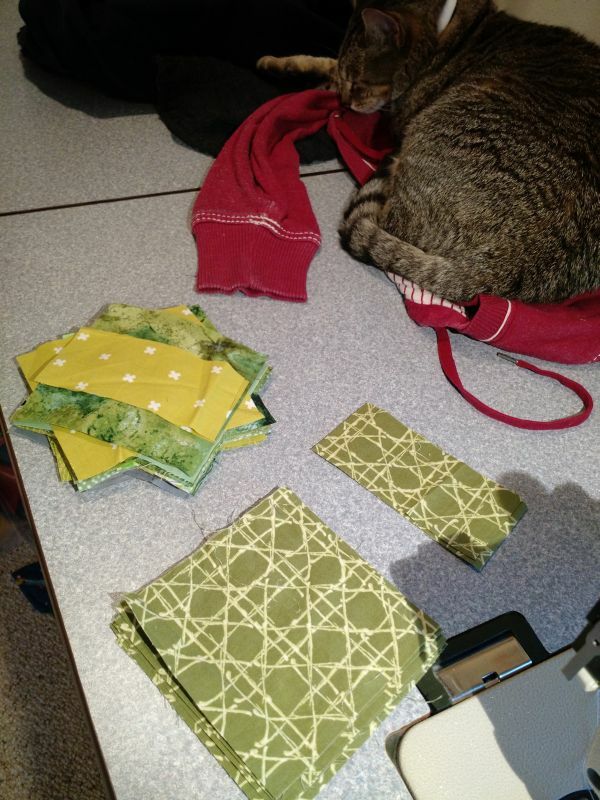 I'm thinking that with the greens I may have enough to finish my first RSC quilt of the year! 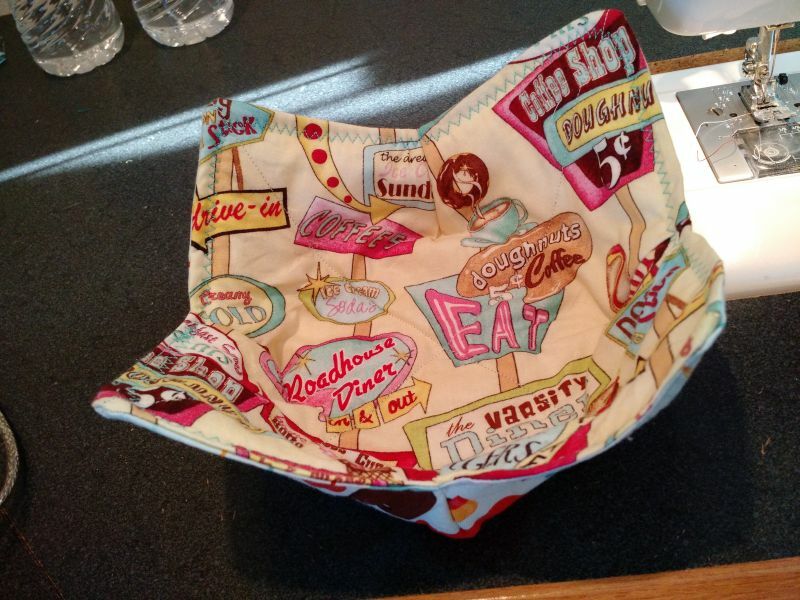 A friend gave me a bowl cozy, but I need to make another. DS2 steals it!! I meant to sort my greens for the RSC tonight, but got sidetracked by cutting fir Hillside Quilter's QAL!! LOVE how your RSC quilt is coming along. Almost done and it's only the first quarter!! 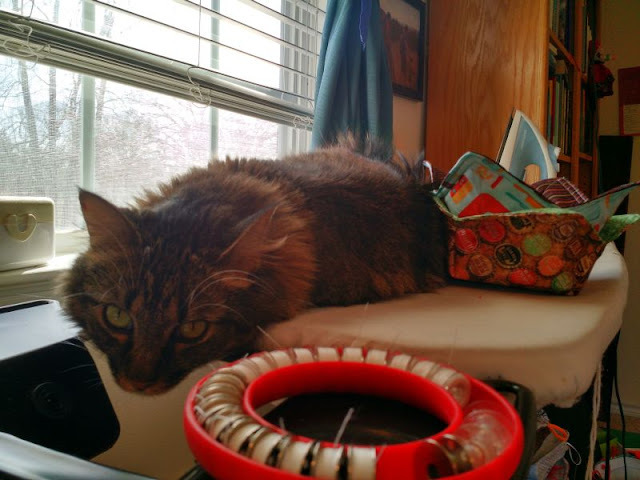 Love your kitty pictures---I think all kitties that belong to quilters do the exact same thing--sleep on the ironing board and our clothes and fabric. What would we do without them ? 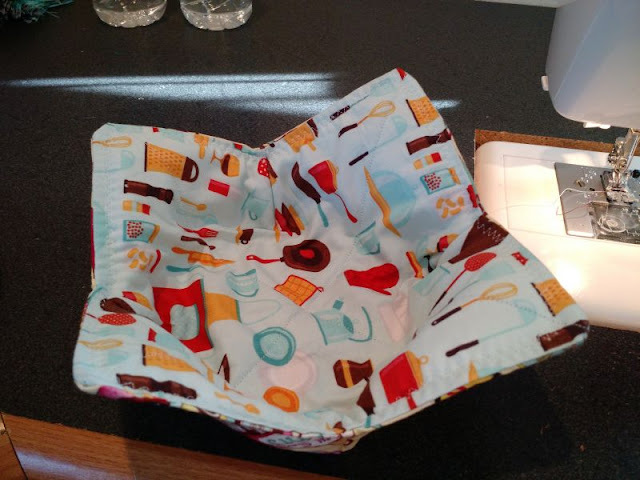 A lot of my friends have been making those bowl cozies, too. How fun that you had such darling fabrics to use! 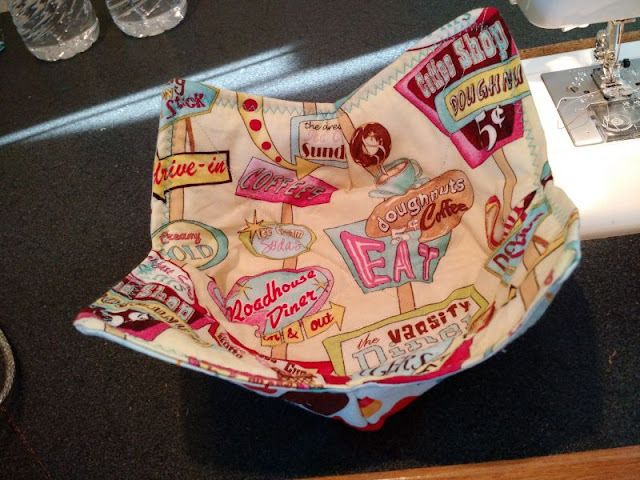 The bowl cozies are adorable, plus very useful. 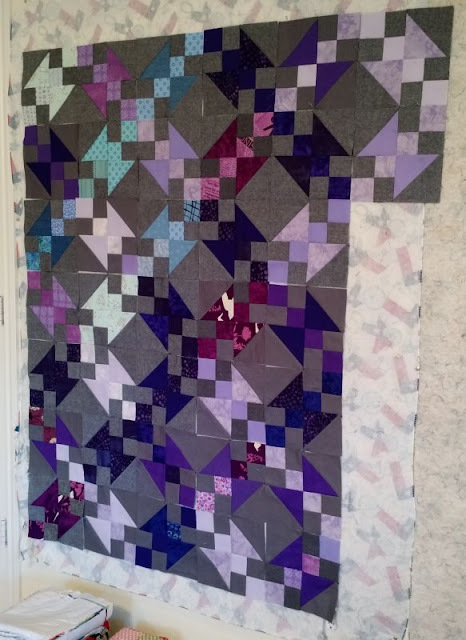 Your purples and blues quilt is gorgeous. All of the fabrics are very cute and bright.